Salads are a great entree or side dish, especially when you are trying to lose weight. Salads are full of vitamins, minerals, phytochemicals and antioxidants from vegetables, fruit and protein-rich foods. Dressings add flavor, but can also add unwanted calories and fat. What you put on your salad can make or break your diet. Choosing low-fat, low-calorie salad dressing alternatives will keep your salad healthful. One of the healthiest dressings for salad is to simply squeeze a little lemon, lime or orange juice over it. This is a nice alternative to heavy, creamy dressings and it adds no fat or calories. Citrus juice also provides a boost of vitamin C, among other vitamins and minerals. It creates a light and tangy yet zesty and fresh tasting salad. Avocados are a green, fleshy fruit belonging to the berry family. They are high in fat, but it is monounsaturated, or good fat, which is known to help lower cholesterol and risk of heart disease. According to the American Dietetic Association, avocados aid the body in absorbing the carotenoids found in salad greens and vegetables. Additionally, avocados help the body to absorb fat-soluble vitamins such as A, D, E and K. Using avocados in dressing is a healthy alternative to oil, which will also help you feel fuller and more satisfied. Vinaigrette style dressings are thin, with an oil and vinegar base. Therefore, these dressings contain fewer calories and fat per serving. 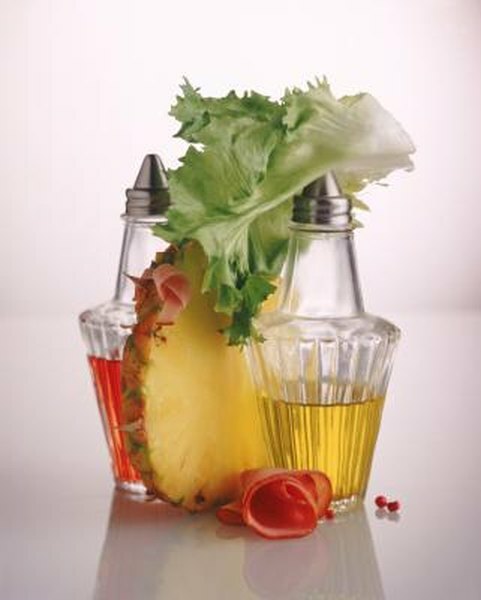 Examples of vinaigrette dressings include garlic, dill, raspberry, balsamic, red wine, lemon and basil vinaigrette. A relatively healthy dressing for any salad is olive oil. You can mix a variety of seasonings, red wine or flax seed oil with olive oil to create different and tasty salad toppings. Olive oil and flax seed do contain fat, but they are good sources of healthy fats, such as monounsaturated and omega 3 fatty acids. These fats help to reduce cholesterol and your risk of heart disease. Traditional French or Italian dressings are favorites among many people. French dressing is a deep red with a tasty herb combination. Italian dressing tends to be zesty, going great with many salads. These two varieties, among regular, full-fat dressings, tend to be the better choices as they are thin, not creamy. They may not have less calories or fat, but they spread more easily, so that you will use less. While some low-fat and fat-free versions are acceptable, you need to watch for added sugar, and therefore, additional calories. If you prefer thick and creamy salad dressings such as Caesar, bleu cheese or ranch, look for yogurt-based varieties rather than high fat, high calorie mayonnaise or sour cream based dressings. Not only is yogurt lower in fat and calories, it provides you with calcium, vitamin D and probiotics.